Look what Janice and Jim did to update and replace their front door. The original door had seen better days and wasn’t very energy efficient. The new door needed to be in keeping with their house’s architecture but they were ready for a new look. Here’s what we came up with! This door is a six-panel fiberglass slab with two sidelites. 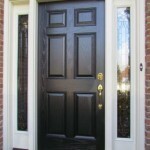 Janice and Jim liked the fiberglass door because it looks so much like wood but doesn’t require as much maintenance. And they selected a black finish which is very traditional and a great look in Louisville. The sidelite glass is a classic design with clear cluster bevels surrounded by clear and gray renaissance glass with patina caming. For energy efficiency, the decorative glass is thermally sealed between two layers of clear glass – effectively triple-paned. The fiberglass slab is also insulated and surrounded by Q-Lon compression weatherstripping for a snug, weather-tight fit in the jamb. When The Door Store and Windows installed the replacement door, we insulated the area around the rough opening before inserting the new jamb. Janice says the cool draft near the entryway is now gone! Beauty – check! Energy efficiency – check! For more ideas, scan through our blog for Door Ideas or Window Ideas.